The portfolio page has been updated with several new wildlife pieces, so go check it out if you like. The new entries include birds, turtles, and a few big cats. In the meantime, I have completed some fantasy pieces recently, which I still do on occasion. These are mostly done in graphite pencil, since I try to save my color pencils for the wildlife work. 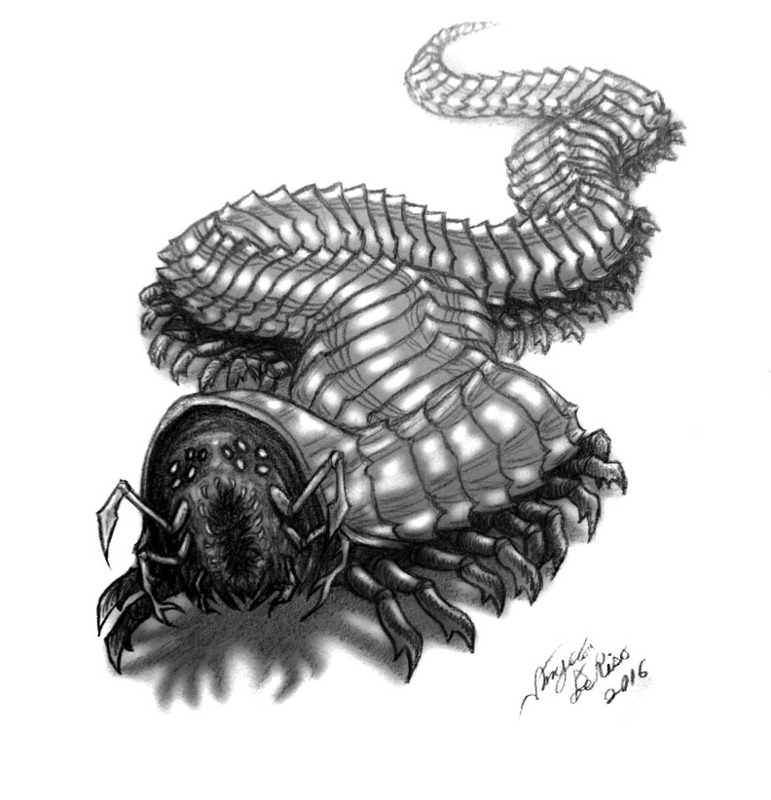 The idea of illustrating the alien creatures/characters from Neal Asher‘s novels had me busy. I went ahead and smashed out the ferocious ‘Hooder’. Technically, they are bio-mechanical war machines made by an ancient alien race. Very millipede-like, but the hood, or front end, is absolutely brutal. 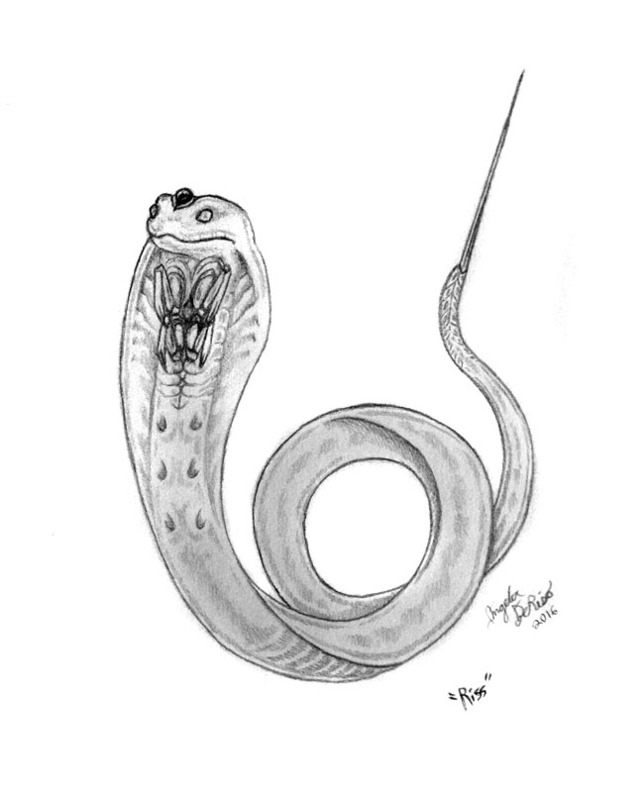 It cuts, slices, and damn-near dissects its prey alive when eating. I doubt if I added enough ‘manipulators’ under that hood, since the descriptions in certain scenes make it seem like they are numerous. After reading Dark Intelligence and War Factory, I had to do a sketch of Riss, the war drone. She accompanies one of the main characters on his journey. She is feisty, and designed to resemble a certain alien parasite(that also just so happens to resemble a Terran snake species.). This was done after viewing many a beautiful stempunk clothing designs, and goggles. I like the idea of a lone desert drifter female with weird lizard companions. 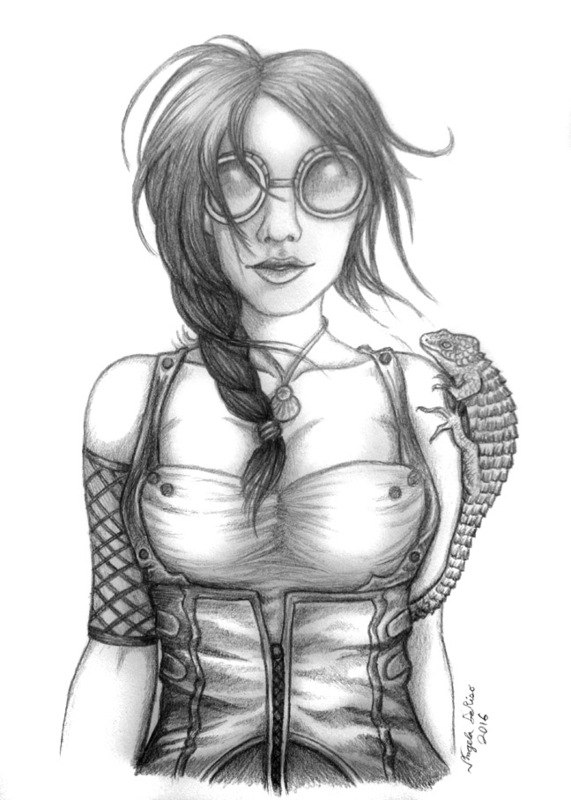 I used a photo of a Mexican Alligator Lizard as reference for the little buddy on her shoulder. A few photos were referenced for pieces of clothing as well. I do love the corsets. Need to try more steampunk themed artwork. This one I worked on for a while, especially when trying to get the face right. 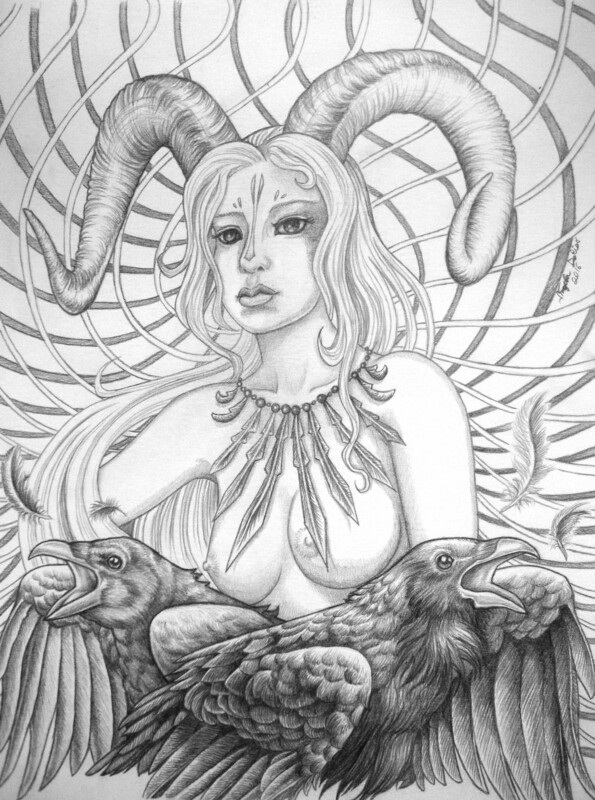 The idea behind it was of a deity associated with crows/ravens. Decided to make her blonde instead of dark haired as would be expected. 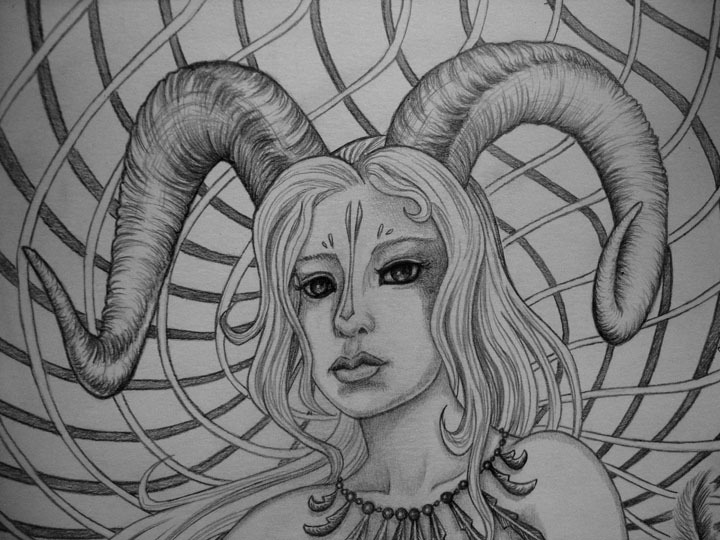 Ram horns were used as reference for texture, and light/shadows. 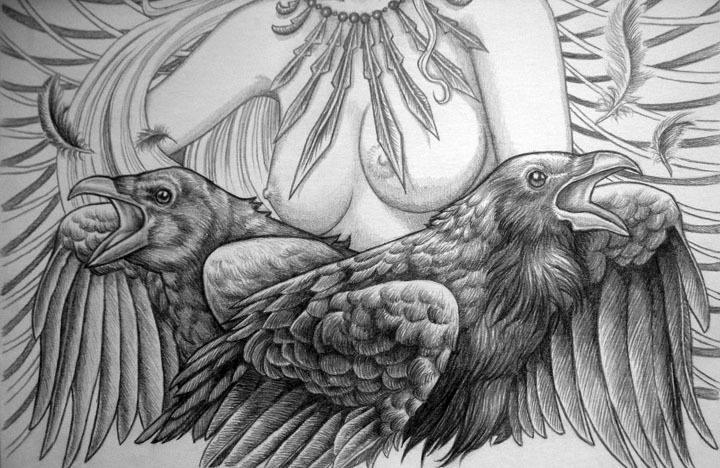 A lot of shading went into the crows feathers/body. The background winding pattern is partly my attempt to fully fill the page, and add something to set the main subjects against instead of just blank space. That’s it for the time being, as I toil away at yet more work to be done.